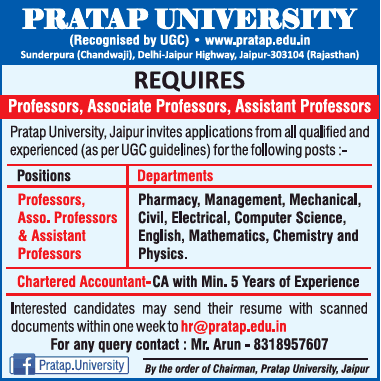 Pratap University, Jaipur has advertised in THE TIMES OF INDIA newspapers for the recruitment of Teaching Faculty- Professor / Associate Professor / Assistant Professor Plus Chartered Accountant jobs vacancies. Interested and eligible job aspirants are requested to apply within 1 week from 16th January 2018. Check out further more details below. About University: The Surya Group of Institutions were established by the Surya Bux Pal Charitable Trust in 2005. The Chairman of the group is Shri Jagdambika Pal, Member of Parliament and Ex Chief Minister of U.P. The courses are duly approved by All India Council for Technical Education, Ministry of Human Resources and Development, Govt. of India and the State Govt. All the courses are affiliated to U.P. Technical University, Lucknow. How to Apply: Eligible and interested candidates are required to send their latest CV with Photograph and copies of certificates to the college email address mentioned below. Mention the post applied for in the subject line of email.